Mention Roxette to a group of people over 40 and you're guaranteed to get some nostalgic smiles, derisive laughs, and a few groans of disapproval. They were one of those Scandinavian bands who never quite seemed to master the English language, and yet were wildly successful in the United States with their carefully-crafted style of pop-rock. I have always liked Roxette, but never quite realized how good their music was until I heard the album Look Sharp! in its entirety a couple of years ago. The Swedish band was formed by guitarist/vocalist Per Gessle and vocalist Marie Fredriksson in the mid-eighties. (Strangely, the duo's backing musicians have never been recognized as official band members.) Before getting together, both Gessle and Fredriksson had recorded several albums and had successful careers in other bands and as solo artists. When they formed Roxette, they were seen as a supergroup of sorts in their native Sweden. Their first album, Pearls of Passion, was originally released only in Scandinavia and Canada. Look Sharp!, their breakthrough second album, was not intended for release in the US by the band's record company, EMI. 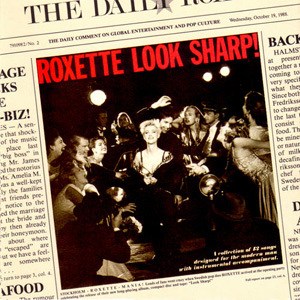 But after Roxette's song "The Look" became an unexpected radio hit in the United States, EMI decided to release the album here, which resulted in a Swedish invasion of the American airwaves not seen since the merciless onslaught of ABBA ten years earlier, producing four hit singles and going on to sell over 10 million copies worldwide. For those who witnessed the Roxette phenomenon in all its lustrous glory, Look Sharp! is a time machine straight back to the late 80s, that fabled era before the Internet when personal computing meant sitting in front of a black screen with a blinking command prompt. The world then was relatively trouble-free compared to what we are dealing with today. Roxette, with songs full of synths and sing-along choruses, seem to embody that time period like no other band. The early 1980s had seen a polarization between fans of synth-pop and guitar rock, who regarded each other as bitter enemies. The genius of Roxette is that they combined elements of both styles perfectly and appealed to both camps to a certain extent. This "something for everybody" approach that combined techno-pop keyboards with rock chord progressions was probably a contributing factor to their massive success. A good example of this synth-rockasis is the song, "The Look," which starts the album with pulsating synth beats and clean, compressed guitars. Per Gessle sings random-ish lyrics about his object of affection: "Her lovin' is a wild dog, she's got the look." Marie Fredriksson alternates between flawless harmonizing and belting out soulful leads. "Dressed for Success," the equally upbeat and infectious second song, switches the spotlight from Gessle's smooth tenor to Marie Fredriksson's impressive vocal talents. Strangely, the title and lyrics of this hit seem to predict the band's near future, written shortly before they became a worldwide phenomenon: "I'm gonna get dressed for success, shaping me up for the big time, baby." Lyrically, the band doesn't concern itself with any type of idealism or social issues on this album. Instead, it focuses on what's really important in life: obsessive love affairs. Most of these songs are sung from the viewpoint of the unrequited or jilted lover. A good example is the third song, "Sleeping Single," which starts with a smoky saxophone and declares: "Sleeping single, I will wait for you... I will die for you." The moodily romantic "Half a Woman, Half a Shadow," features an interesting chord progression that defies categorization. "Cry" really knocks it out of the park and shows Roxette as a force to be reckoned with in the love ballad department. The arrangement of this one and the multitracked backing vocals are like the plush carpeting of an 80s living room. You just want to lay back in it and stare at the ceiling and feel content that the technological age has finally arrived and utopia is right around the corner. Elsewhere the mood is one of irrepressible neon-light happiness. "Dance Away" will have you doing just that. "Paint," sung by Gessle, sports a bouncy Prince-like sensibility and another catchy chorus, where Fredriksson shows her soft and gentle side. "View from a Hill," later on the album, continues the p-funk vibe with a funky sax on the chorus. This one easily could have been a song from a Janet Jackson album from the same time period. All three songs are such guilty pleasures you will look both ways to make sure no one's watching before you tap your foot. The album ends as it begins, with one of the band's biggest hits. The anthemic love ballad, "Listen to Your Heart," makes a fitting conclusion to this pop masterpiece of an album. There are several other great songs on this album that I haven't talked about, so I would definitely recommend further investigation. The contagiously silly na-na-na-na-nas at the end of "The Look" may as well have been the trumpets of Armageddon because it was all downhill from there in the world of major-label pop music. These days, as the real end times seem closer than ever, and the first two horsemen of the apocalypse, Hillary and Trump, sit perched atop their black steeds, surveying the landscape with cold, unforgiving eyes, Look Sharp! is an album that can make you forget about all of that for 54 minutes.